A person attempting to show his teeth and raise his eyebrows with Bell's palsy on his right side (left side of the image). Bell's palsy is a form of facial paralysis resulting from a dysfunction of the cranial nerve VII (the facial nerve) causing an inability to control facial muscles on the affected side. Often the eye in the affected side cannot be closed. The eye must be protected from drying up, or the cornea may be permanently damaged resulting in impaired vision. In some cases denture wearers experience some discomfort. The common presentation of this condition is a rapid onset of partial or complete paralysis that often occurs overnight. In rare cases (<1%), it can occur on both sides resulting in total facial paralysis. Bell's palsy is defined as a one sided facial nerve paralysis of unknown cause. Several other conditions can also cause facial paralysis, e.g., brain tumor, stroke, myasthenia gravis, and Lyme disease; however, if no specific cause can be identified, the condition is known as Bell's palsy. It is thought that an inflammatory condition leads to swelling of the facial nerve. The nerve travels through the skull in a narrow bone canal beneath the ear. Nerve swelling and compression in the narrow bone canal are thought to lead to nerve inhibition, damage or death. Usually it gets better on its own with most people achieving normal or near-normal function. Corticosteroids have been found to improve outcomes, when used early, while anti-viral drugs have not. Many show signs of improvement as early as 10 days after the onset, even without treatment. Bell's palsy is the most common acute disease involving a single nerve and is the most common cause of acute facial nerve paralysis (>80%). It is named after Scottish anatomist and Edinburgh graduate Charles Bell (1774–1842), who first described it. It is more common in adults than children. 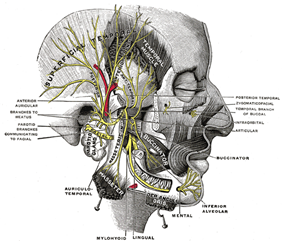 Facial nerve: the facial nerve's nuclei are in the brainstem (they are represented in the diagram as a „θ“). Orange: nerves coming from the left hemisphere of the brain. Yellow: nerves coming from the right hemisphere of the brain. Note that the forehead muscles receive innervation from both hemispheres of the brain (represented in yellow and orange). Bell's palsy is characterized by a one sided facial droop that comes on within 72 hours. The facial nerves control a number of functions, such as blinking and closing the eyes, smiling, frowning, lacrimation, salivation, flaring nostrils and raising eyebrows. They also innervate the stapedial (stapes) muscles of the middle ear and carry taste sensations from the anterior two-thirds of the tongue. Because both the nerve to the stapedius and the chorda tympani nerve (taste) are branches of the facial nerve, people with Bell's palsy may present with hyperacusis or loss of taste sensation in the anterior 2/3 of the tongue. The forehead muscles are usually affected. Although defined as a mononeuritis (involving only one nerve), people diagnosed with Bell’s palsy may have "myriad neurological symptoms" including "facial tingling, moderate or severe headache/neck pain, memory problems, balance problems, ipsilateral limb paresthesias, ipsilateral limb weakness, and a sense of clumsiness" that are "unexplained by facial nerve dysfunction". Some viruses are thought to establish a persistent (or latent) infection without symptoms, e.g., the varicella-zoster virus and Epstein-Barr viruses, both of the herpes family. Reactivation of an existing (dormant) viral infection has been suggested as a cause of acute Bell's palsy. Studies suggest that this new activation could be preceded by trauma, environmental factors, and metabolic or emotional disorders, thus suggesting that a host of different conditions may trigger reactivation. Once the facial paralysis sets in, many people may mistake it as a symptom of a stroke. But there are a few subtle differences. A stroke will usually cause a few additional symptoms, such as numbness or weakness in the arms and legs. And unlike Bell's palsy, a stroke will usually let patients control the upper part of their faces. A person with a stroke will usually have some wrinkling of their forehead. Bell's palsy occurs due to a malfunction of the facial nerve (VII cranial nerve), which controls the muscles of the face. Facial palsy is typified by inability to control movement in the facial muscles. The paralysis is of the infranuclear/lower motor neuron type. It is thought that as a result of inflammation of the facial nerve, pressure is produced on the nerve where it exits the skull within its bony canal, blocking the transmission of neural signals or damaging the nerve. Patients with facial palsy for which an underlying cause can be found are not considered to have Bell's palsy per se. Possible causes include tumor, meningitis, stroke, diabetes mellitus, head trauma and inflammatory diseases of the cranial nerves (sarcoidosis, brucellosis, etc.). In these conditions, the neurologic findings are rarely restricted to the facial nerve. Babies can be born with facial palsy. In a few cases, bilateral facial palsy has been associated with acute HIV infection. In some research the herpes simplex virus type 1 (HSV-1) has been identified in a majority of cases diagnosed as Bell's palsy. This has given hope for anti-inflammatory and anti-viral drug therapy (prednisone and acyclovir). Other research, however, identifies HSV-1 in only 31 cases (18 percent), herpes zoster (zoster sine herpete) in 45 cases (26 percent) in a total of 176 cases clinically diagnosed as Bell's Palsy. That infection with herpes simplex virus should play a major role in cases diagnosed as Bell's palsy therefore remains a hypothesis that requires further research. In addition, the herpes simplex virus type 1 (HSV-1) infection is associated with demyelination of nerves. This nerve damage mechanism is different from the above-mentioned - that edema, swelling and compression of the nerve in the narrow bone canal is responsible for nerve damage. Demyelination may not even be directly caused by the virus, but by an unknown immune system response. One study found that 45% of patients are not referred to a specialist, which suggests that Bell’s palsy is considered by physicians to be a straightforward diagnosis that is easy to manage. Steroids have been shown to be effective at improving recovery in Bell's palsy while antivirals have not. In those who are unable to close their eyes, eye protective measures are required. Corticosteroid such as prednisone significantly improves recovery at 6 months and are thus recommended. Early treatment (within 3 days after the onset) is necessary for benefit with a 14% greater probability of recovery. Antivirals (such as aciclovir) are ineffective in improving recovery from Bell's palsy beyond steroids alone. They were however commonly prescribed due to a theoretical link between Bell's palsy and the herpes simplex and varicella zoster virus. There is still the possibility that they might result in a benefit less than 7% as this has not been ruled out. Physiotherapy can be beneficial to some individuals with Bell’s palsy as it helps to maintain muscle tone of the affected facial muscles and stimulate the facial nerve. It is important that muscle re-education exercises and soft tissue techniques be implemented prior to recovery in order to help prevent permanent contractures of the paralyzed facial muscles. To reduce pain, heat can be applied to the affected side of the face. There is no high quality evidence to support the role of electrical stimulation for Bell's palsy. The efficacy of acupuncture remains unknown because the available studies are of low quality (poor primary study design or inadequate reporting practices). Most people with Bell's palsy start to regain normal facial function within 3 weeks—even those who do not receive treatment. In a 1982 study, when no treatment was available, of 1,011 patients, 85% showed first signs of recovery within 3 weeks after onset. For the other 15%, recovery occurred 3–6 months later. After a follow-up of at least 1 year or until restoration, complete recovery had occurred in more than two-thirds (71%) of all patients. Recovery was judged moderate in 12% and poor in only 4% of patients. Another study found that incomplete palsies disappear entirely, nearly always in the course of one month. The patients who regain movement within the first two weeks nearly always remit entirely. When remission does not occur until the third week or later, a significantly greater part of the patients develop sequelae. A third study found a better prognosis for young patients, aged below 10 years old, while the patients over 61 years old presented a worse prognosis. Another complication can occur in case of incomplete or erroneous regeneration of the damaged facial nerve. The nerve can be thought of as a bundle of smaller individual nerve connections that branch out to their proper destinations. During regrowth, nerves are generally able to track the original path to the right destination - but some nerves may sidetrack leading to a condition known as synkinesis. For instance, regrowth of nerves controlling muscles attached to the eye may sidetrack and also regrow connections reaching the muscles of the mouth. In this way, movement of one also affects the other. For example, when the person closes the eye, the corner of the mouth lifts involuntarily. Around 9% of patients have some sort of sequelae after Bell's palsy, typically the synkinesis already discussed, or spasm, contracture, tinnitus and/or hearing loss during facial movement or crocodile tear syndrome. This is also called gustatolacrimal reflex or Bogorad’s Syndrome and involves the sufferer shedding tears while eating. This is thought to be due to faulty regeneration of the facial nerve, a branch of which controls the lacrimal and salivary glands. Gustatorial sweating can also occur. The annual incidence of Bell's palsy is about 20 per 100,000 population, and the incidence increases with age. Bell’s palsy affects about 40,000 people in the United States every year. It affects approximately 1 person in 65 during a lifetime. Familial inheritance has been found in 4–14% of cases. Bell's palsy is three times more likely to strike pregnant women than non-pregnant women. It is also considered to be four times more likely to occur in diabetics than the general population. A range of annual incidence rates have been reported in the literature: 15, 24, and 25–53 (all rates per 100,000 population per year). Bell’s palsy is not a reportable disease, and there are no established registries for patients with this diagnosis, which complicates precise estimation. The Persian physician Rhazes (865–925) detailed the first known description of peripheral and central facial palsy. Cornelis Stalpart van der Wiel (1620–1702) in 1683 gave an account of Bell’s palsy and credited Avicenna (980–1037) for describing this condition before him. James Douglas (1675–1742) and Nicolaus Anton Friedreich (1761–1836) also described it. ^ Price, Fife, T; Fife, DG (January 2002). "Bilateral simultaneous facial nerve palsy". J Laryngol Otol. 116 (1): 46–8. ^ Jain V, Deshmukh A, Gollomp S (July 2006). "Bilateral facial paralysis: case presentation and discussion of differential diagnosis". J Gen Intern Med 21 (7): C7–10. ^ a b Sullivan FM, Swan IR, Donnan PT et al. (October 2007). "Early treatment with prednisolone or acyclovir in Bell's palsy". N. Engl. J. Med. 357 (16): 1598–607. ^ a b c d Baugh, RF; Basura, GJ; Ishii, LE; Schwartz, SR; Drumheller, CM; Burkholder, R; Deckard, NA; Dawson, C; Driscoll, C; Gillespie, MB; Gurgel, RK; Halperin, J; Khalid, AN; Kumar, KA; Micco, A; Munsell, D; Rosenbaum, S; Vaughan, W (November 2013). "Clinical Practice Guideline: Bell's Palsy Executive Summary.". Otolaryngology--head and neck surgery : official journal of American Academy of Otolaryngology-Head and Neck Surgery 149 (5): 656–63. ^ a b c Morris AM, Deeks SL, Hill MD et al. (2002). "Annualized incidence and spectrum of illness from an outbreak investigation of Bell's palsy". Neuroepidemiology 21 (5): 255–61. ^ a b Furuta Y, Ohtani F, Chida E, Mesuda Y, Fukuda S, Inuyama Y (2001). "Herpes simplex virus type 1 reactivation and antiviral therapy in patients with acute peripheral facial palsy". Auris Nasus Larynx 28 (Suppl): S13–7. ^ a b Kasse C.A, Ferri R.G, Vietler E.Y.C, Leonhardt F.D, Testa J.R.G, Cruz O.L.M (October 2003). "Clinical data and prognosis in 1521 cases of Bell's palsy". International Congress Series 1240: 641–7. ^ Lorch, M; Teach, SJ (Oct 2010). "Facial nerve palsy: etiology and approach to diagnosis and treatment.". Pediatric emergency care 26 (10): 763–9; quiz 770–3. ^ Murakami S, Mizobuchi M, Nakashiro Y, Doi T, Hato N, Yanagihara N (1996). "Bell palsy and herpes simplex virus: identification of viral DNA in endoneurial fluid and muscle". Annals of Internal Medicine 124 (1 Pt 1): 27–30. ^ Salinas RA, Alvarez G, Daly F, Ferreira J (2010). Salinas, Rodrigo A, ed. "Corticosteroids for Bell's palsy (idiopathic facial paralysis)". Cochrane Database of Systematic Reviews 3 (3): CD001942. ^ Hazin, R; Azizzadeh, B; Bhatti, MT (November 2009). "Medical and surgical management of facial nerve palsy". Current Opinion in Ophthalmology 20 (6): 440–50. ^ Gronseth, GS; Paduga, R (Nov 7, 2012). "Evidence-based guideline update: Steroids and antivirals for Bell palsy: Report of the Guideline Development Subcommittee of the American Academy of Neurology". Neurology 79 (22): 2209–13. ^ Lockhart P, Daly F, Pitkethly M, Comerford N, Sullivan F (2009). Lockhart, Pauline, ed. "Antiviral treatment for Bell's palsy (idiopathic facial paralysis)". Cochrane Database of Systematic Reviews (4): CD001869. ^ Gronseth, GS; Paduga, R; American Academy of, Neurology (Nov 27, 2012). "Evidence-based guideline update: steroids and antivirals for Bell palsy: report of the Guideline Development Subcommittee of the American Academy of Neurology". Neurology 79 (22): 2209–13. ^ a b "Bell's Palsy Fact Sheet". National Institute of Neurological Disorders and Stroke. April 2003. Archived from the original on 8 April 2011. Retrieved 2011-05-12. ^ Shafshak, TS (March 2006). "The treatment of facial palsy from the point of view of physical and rehabilitation medicine". Europa Medicophysica 42 (1): 41–7. ^ Teixeira, Lázaro J; Valbuza, J. S.; Prado, G. F. (Dec 2011). "Physical therapy for Bell's palsy (idiopathic facial paralysis)". Cochrane Database of Systematic Reviews (12): CD006283. ^ a b Hazin R, Azizzadeh B, Bhatti MT; Azizzadeh; Bhatti (November 2009). "Medical and surgical management of facial nerve palsy". Current Opinion in Ophthalmology 20 (6): 440–50. ^ McAllister, K; Walker, D; Donnan, PT; Swan, I (Feb 16, 2011). Swan, Iain, ed. "Surgical interventions for the early management of Bell's palsy". Cochrane Database of Systematic Reviews (2): CD007468. ^ a b Tiemstra, JD; Khatkhate, N (Oct 1, 2007). "Bell's palsy: diagnosis and management". American family physician 76 (7): 997–1002. ^ He L, Zhou MK, Zhou D et al. (2007). He, Li, ed. "Acupuncture for Bell's palsy". Cochrane Database of Systematic Reviews (4): CD002914. ^ Karnath, B. "Bell Palsy: Updated Guideline for Treatment". Consultant. HMP Communications. Retrieved April 3, 2013. ^ Peitersen E (1982). "The natural history of Bell's palsy". Am J Otol 4 (2): 107–11. ^ Peitersen E, Andersen P; Andersen (1966). "Spontaneous course of 220 peripheral non-traumatic facial palsies". Acta Otolaryngol. : Suppl 224:296+. ^ Yamamoto E, Nishimura H, Hirono Y; Nishimura; Hirono (1988). "Occurrence of sequelae in Bell's palsy". Acta Otolaryngol Suppl 446: 93–6. ^ Ahmed A (2005). "When is facial paralysis Bell palsy? Current diagnosis and treatment". Cleve Clin J Med 72 (5): 398–401, 405. ^ a b Döner F, Kutluhan S; Kutluhan (2000). "Familial idiopathic facial palsy". Eur Arch Otorhinolaryngol 257 (3): 117–9. ^ Bender, Paula Gillingham. "Facing Bell's Palsy while pregnant." (Commercial website). Sheknows: Pregnancy and Baby. Retrieved on 2007-09-06. ^ "Bell's Palsy InfoSite & Forums: Facial Paralysis FAQs" (Website). Bell's Palsy Information Site. Retrieved on 2007-09-06. ^ Wolf SR (1998). "[Idiopathic facial paralysis]". HNO (in German) 46 (9): 786–98. ^ Sajadi MM, Sajadi MR, Tabatabaie SM; Sajadi; Tabatabaie (July 2011). "The history of facial palsy and spasm: Hippocrates to Razi". Neurology 77 (2): 174–8. ^ van de Graaf RC, Nicolai JP; Nicolai (November 2005). "Bell's palsy before Bell: Cornelis Stalpart van der Wiel's observation of Bell's palsy in 1683". Otol. Neurotol. 26 (6): 1235–8.